A risk is the potential harm to a population due to a hazard. Tsunamis are hazards which pose a major risk to the human population as the high speed waves can cause death and major damages to infrastructure and property. Tsunami experiences such as the 2004 Indian Ocean Tsunami which caused over 230,000 lives to be lost and the 2011 Great East Japan Earthquake and Tsunami which resulted in the deaths of over 15,000 persons as well as extensive and severe structural damage to buildings and infrastructure are vivid realities of the devastating potential of tsunamis. All known sources capable of causing tsunamis are found within the Caribbean and its adjacent regions, and there is also the risk of distant tsunami sources across the Atlantic Ocean. The Caribbean and adjacent regions lie in seismically active zones, with the Caribbean in particular being traversed by a diverse set of geologic features including deep ocean trenches, underwater volcanoes, plate boundaries and fault lines. These features have the potential to spawn a variety of hazards and as with the Indian Ocean and Japan our region is prone to earthquakes and volcanic eruptions which can generate tsunamis. The tsunami risk to the Caribbean and Central West Atlantic Region is fourfold: locally generated by earthquakes, sub-aerial or submarine landslides, sub-aerial or submarine volcanoes, and tele-tsunamis (Mader, 2004). Scientific records over the last 500 years indicate the occurrence of both local and distant tsunamis impacting our region. Tsunami observations over the past 500 years in the Caribbean and Adjacent Regions. Wave heights up to 18.3 meters. Credit: J. Varner, NOAA. According to Bryant (1991), approximately 25% of the Earth’s tsunami events occur in the North Atlantic Basin, which includes the Caribbean and Mediterranean Seas. More specifically, the Caribbean and its adjacent seas, including the Atlantic, have been the source region for 11% of the world’s fatal tsunamis over history, with almost 100 tsunamis observed that have impacted 23 countries of this region. Most frequently a secondary hazard due to earthquakes, landslides and volcanic eruptions, tsunamis rank as the fourth most lethal of the natural phenomena to have affected the Caribbean islands but their potential for devastation is vast. 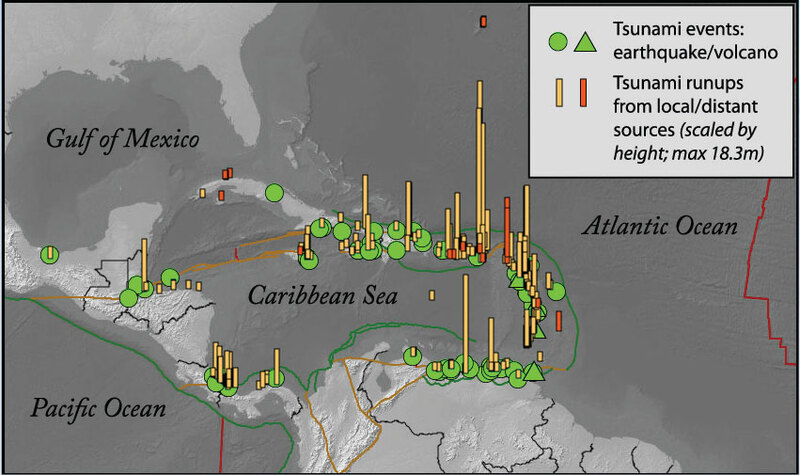 In the Caribbean and adjacent regions, during the last 500 years there have been more than 75 tsunamis documented in the Caribbean and adjacent regions (von Hillebrandt-Andrade, 2013). The Norwegian Technical Institute indicated that many of these tsunamis have caused incalculable damage particularly loss of life and damage to property (NGI, 2009). Almost 20 of the tsunamis experienced during this time period have caused deaths, and in fact, since 1842 it is reported that 3446 people perished in these events (von Hillebrandt-Andrade, 2013). Over the last hundred years or so, there have been 39 events, or about one every 2-3 years and more recently, during the 2010 tsunami in Haiti reports indicate that at least 7 lives were lost. Tsunami mudline watermarks on the inside wall and flow depth being measured in a house damaged by the January 12, 2010 tsunami at Petit Paradis, Haiti. Source: Dr. Hermann M. Fritz. Based on this historical evidence, the region can expect to experience approximately 4 destructive tsunamis per century. It is estimated that at least 500,000 residents and visitors are exposed daily along the shores to this threat with hundreds of thousands more working and living in the tsunami hazard zones (von Hillebrandt-Andrade, 2013). With growing populations and a concentration of infrastructure along the coastlines – much of which is linked to tourism – an event of similar proportions to those characterised as the most destructive carry a high level of risk and must be anticipated. This does not mean that one should not go to the beach or be fearful, just be sure to know about the natural tsunami warning signs and your country’s system for tsunami alerting. The risk exposure which the Caribbean and adjacent regions face without a coordinated and comprehensive tsunami mitigation programme is magnified. If left unchecked, in the event of a tsunami impact these circumstances will result in the loss of lives and widespread destruction drawing significantly on public finances and undermining the capacity of the private sector to sustain investment and growth. Current impacts of climate change events within the region can exacerbate the potential effects of a tsunami event. Prior to the 2004 Indian Ocean catastrophe, the infrequency of tsunamis had disarmed scientists, decision makers, funding agencies and policy makers, but we have since learnt from this tragedy and other experiences, appreciating the true potential of this hazard. 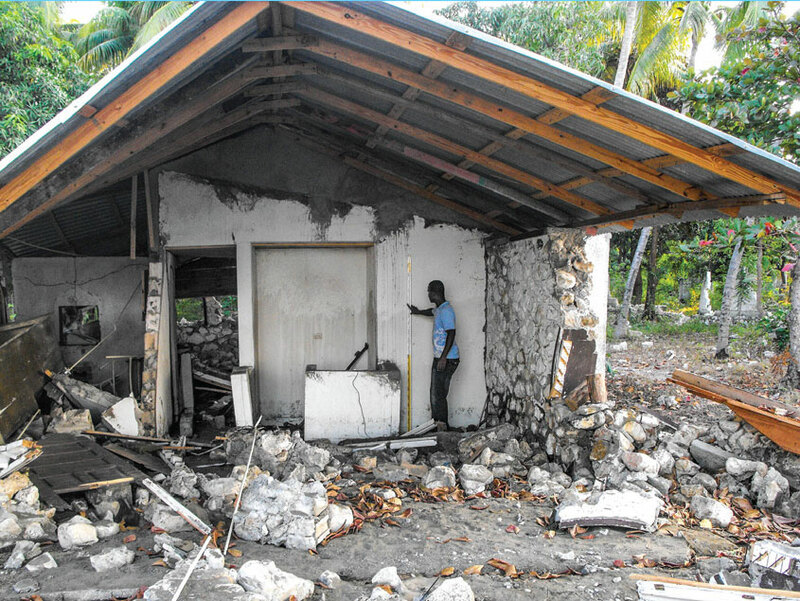 After 2004, UNESCO/IOC has led Member States across the globe to develop their own regional and national tsunami early warning systems (TEWS) including long term mitigation measures and a programme to educate and prepare endangered communities for future events. Within this international framework, there are four (4) TEWS are at various levels of development, serving the Caribbean and Adjacent Regions , the Pacific, the Indian Ocean as well as the North-western Atlantic and the Mediterranean regions.